Region 1 of the Philippines is located in the northwestern part of Luzon. It is bounded by Cordillera Administrative Region and Cagayan Valley to the east, Central Luzon to the south and by the South China Sea to the west. 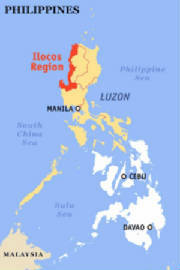 The region is composed of four provinces, namely: Ilocos Norte, Ilocos Sur, La Union and Pangasinan. Its regional center is San Fernando City, La Union. The region is occupied 70% by Ilocanos and 28% by Pangasinenses.